Aldeburgh, as Scott Fitzgerald might have observed, is different from the rest of Suffolk. Actually, if a writer was going to say this, perhaps E.M. Forster is more likely; he spent a lot of time here with his friend Benjamin Britten, and there's a memorable photograph of them sitting together in a boat. Aldeburgh, pronounced Orld-brur, is, of course, the home of the Aldeburgh festival; but at anytime you'll find it full of visitors, many of them mild eccentrics, dressed colourfully for the season. Perhaps only in Lavenham would you find it harder to track down a local. The town's shops are thriving as a consequence, but even in winter the streets can become a car park on a sunny day. Don't even think of being able to park in high summer. The difference between Lavenham and Aldeburgh, though, is that people often come here to stay. The desirable 18th and 19th century houses the length of the front are one of the reasons. Crag House, just down from the church and one of the largest, was where Britten lived for many years. Britten was born 20 miles north at Kirkley, in Lowestoft, where his father was a dentist. But it took him three years in America to realise that Suffolk was where he wanted to be, and so at the height of wartime he undertook the dangerous journey home with his partner, Peter Pears. They rented out the old mill at nearby Snape, where Britten wrote his first masterpiece, Peter Grimes, based on Crabbe's story The Borough, about a fishing village, where the anti-hero Grimes suffers the wrath of the community's hypocrisy, for his ill-treatment of his apprentices. One of the major scenes in the opera takes place in this church, for the Borough, of course, is Aldeburgh. It also appears in Wilkie Collins' finest novel, No Name, as Aldborough. In later life, Britten and Pears moved to the Red House, near the quiet seclusion of the golf course; but their real local testament is, of course, Snape Maltings, the great arts complex three miles away, finished in the years before Britten's tragically early death in 1976. Given that this town was a popular and wealthy resort in the 19th century, it is no surprise that the church has been almost completely restored, and very little internal evidence survives of its Catholic liturgical life. Aldeburgh's Catholic priests today minister the sacraments at Our Lady and St Peter, at the top of the hill 100 yards to the south. But St Peter and St Paul is a fine, municipal Anglican parish church, and should be enjoyed for that. Externally, it is rather more interesting. The south porch adjoins the pavement, and has arches in its east and west walls to allow processions to pass within the precincts of the graveyard. This was built by the Holy Trinity gild, right on the eve of the Reformation. Because of its proximity to the road, the church has an imposing presence. The grand 14th century tower is not typical of the coast; with its towering stair turret, it looks more like Hoxne or Stradbroke. You enter the church from the west, into the darkness beneath the tower, very like that at Debenham. This church is always open during the day, and has a cheerful welcome notice. You step into a warm, bright interior, with plenty of 19th century touches. The finest feature here is, of course, the Britten memorial. It is by the artist John Piper, in stained glass, and shows images from three of his church parables: The Prodigal Son, Curlew River, and The Burning Fiery Furnace. It sits in the north aisle, and gets enough light to fill the aisle with colour. The font sits in front of it. The colour of the sanctuary tempers its rather stern Tractarian makeover, but there are also plenty of reminders of the life of the Borough in years and centuries gone by. The lifeboat disaster memorial is a grand example of late Victorian copperwork at the west end. Rather finer is the town war memorial in the south aisle, the golden rays of the dying soldier's nimbus illuminating the inscription and everyone said to his brother be of good cheer. There is a fine monument in the south chapel to Lady Henrietta Vernon. This chapel was the chantry chapel of the Holy Trinity guild before the Reformation. Large squints sit either side of the chancel arch, marking the positions of altars. Today, a fine, early 17th century pulpit stands in front of one: the documentation still exists for its commissioning. The wooden angels guarding the sanctuary are a curiously naive touch. The glass in both chancel and south aisle east windows is excellent; St Cecilia is happily present, and reminds us that the musical tradition of Aldeburgh predated Britten. The lyrical tradition did as well, because against the arcade in the north aisle is the memorial to the poet George Crabbe. This is a nice church, and a welcoming one. 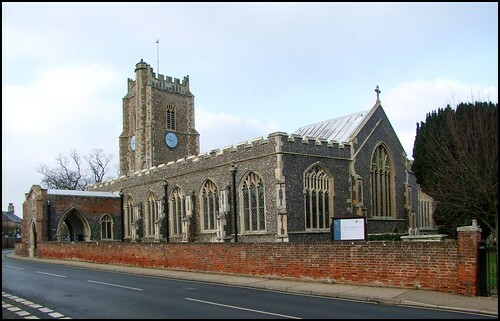 It isn't terribly significant as Suffolk churches go, but I prefer it to some of the more self-important ones. I'm also a big fan of Britten, which is another reason I like it. If you are looking for Britten's gravestone, don't look for anything grand. The large one towards the east wall is a memorial to the crew of the lifeboat who all died in the 1899 disaster here. This is very moving, despite the arch piety typical of that decade. No, Britten's stone sits in the common run, along with the other 1976 graves. Beside it, space was reserved for Peter Pears, who died in the 1980s. By one of those acts of serendipity, the musician Imogen Holst, daughter of the composer Gustav Holst, lies just behind them. It doesn't take long, looking around, to locate the graves of other musicians and singers, who all came to Aldeburgh attracted by Britten's light. Also buried here is Elizabeth Garrett Anderson, one of the Garretts who built the Snape maltings complex as part of their industrial empire. She, of course, is famous for being the first woman doctor in England. Less well known is the fact that she was also the first ever female mayor in England - of Aldeburgh, of course.